We understand the anxiety that can arise when the subject of removing wisdom teeth surfaces among teens and parents. But we assure you that our compassionate and highly qualified medical team will gently guide your child through every step of the process and answer any questions you may have. 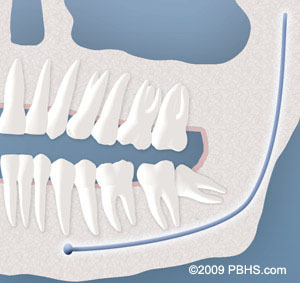 Wisdom teeth commonly begin erupting between the ages of 17 and 25. Though some people never experience any concerns, most patients will need to have their wisdom teeth removed to avoid harming their oral health. We understand the anxiety that can arise when the subject of removing wisdom teeth surfaces among teens and parents. But we assure you that our compassionate and highly qualified medical team will gently guide your child through every step of the process and answer any questions you may have. 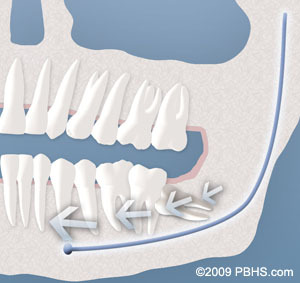 Wisdom teeth commonly begin erupting between the ages of 17 and 25. Though some people never experience any concerns, most patients will need to have their wisdom teeth removed to avoid harming their oral health. Even if they do not cause tooth pain, wisdom teeth are still susceptible to cavities, gum disease, abscesses, and cysts, as well as potentially crowding or damaging other teeth. We recommend that wisdom teeth extractions be completed while the patient is still young before the tooth roots have fully formed in the bone which may require more complex surgery. Younger patients also heal and recover faster and with less risk for infection or complications after surgery. If you are experiencing symptoms, wisdom tooth removal will eliminate your tooth pain and improve the health of your smile. Does it hurt to get my wisdom teeth removed? Why choose Dr. Bolourian for my wisdom teeth removal? 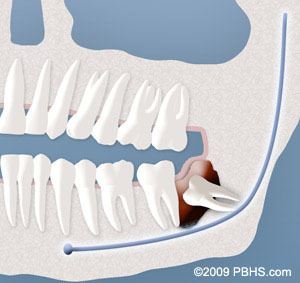 Wisdom teeth, also known as third molars, are the last to erupt and are located in the back of your mouth. Types of Impactions We will need to see you for a consultation to determine if you will benefit from wisdom tooth removal. A special x-ray of your mouth and jaws (Panorex) will be taken to determine if your wisdom teeth are impacted if there is room for them to erupt, and how difficult it will be to have them removed. With an oral examination and x-rays of the mouth, Dr. Bolourian can evaluate the position of the wisdom teeth and predict if there are present or future potential problems. Studies have shown that early evaluation and treatment result in a superior outcome for the patient. Patients are generally first evaluated in the mid-teenage years by their dentist, orthodontist, or by an oral and maxillofacial surgeon. Most people prefer to be unaware of the experience when they have their wisdom teeth removed and usually decide to be sedated. You will be provided with appropriate anesthesia options at your consultation. All outpatient surgery is performed under appropriate anesthesia to maximize your comfort. Our office staff has the training, licensing, and experience to provide the various types of anesthesia. These services are provided in an environment of optimum safety, utilizing modern monitoring equipment and a well-trained experienced staff. The Surgical Care Team, the office facilities, and the doctors are inspected on behalf of the Board of Dental Examiners on a regular basis. Once the local anesthesia wears off, you may require prescription pain medication. Please try non-narcotic anti-inflammatory medications such as ibuprofen (Advil®) first, to see if that adequately treats your pain. If not, begin your other prescription pain medication. The local anesthesia may last until the following day, and should not be confused with an injury to your nerve. We recommend starting your post-operative diet with clear liquids, such as jello and broths, gradually increasing in substance as your body permits. Wisdom teeth extractions are usually performed under IV sedation in our surgical suite. We offer a surgical facility comparable to an accredited hospital operating room surgical suite. Prior to your surgery, Dr. Bolourian provides a full physical examination, reviews your medical and surgical history and all medications you might be taking. He then performs a complete dental examination with special x-rays. This assists us in planning your surgery and helps us predict issues that may arise in the future. During surgery, our board-certified oral surgeon, Dr. Reza Bolourian, uses cutting-edge techniques to remove wisdom teeth conservatively and carefully. You may experience soreness and swelling after the procedure, but most symptoms resolve within the week and you are free to continue with non-strenuous daily activities 24 hours after surgery. Wisdom tooth extractions are one of several common and routine procedures done by our oral surgeon, Dr. Reza Bolourian. Specialized in oral surgery like wisdom tooth extractions, Dr. Bolourian also completed 7 years of surgical residency and holds a dual DDS and MD degrees. If complications arise during surgery, he is trained to address the issue and avoid further problems. Dr. Bolourian is board-certified in oral surgery and maxillofacial surgery, a prestigious title that sets him apart as a specialist committed to the highest standard of oral surgery care.